This roofing calculator will estimate the approximate cost to install a new TPO roof system (50, 60 or 80-mil). The tool also provides an option to estimate the cost of installing competing single-ply flat roofing materials (PVC and EPDM rubber roofing), as well as Tar & Gravel and Built-up Roofing (Rolled Asphalt / Modified Bitumen). To estimate roofing cost, enter roof / building dimensions, choose tear-off options, new ISO insulation and the number of roof curbs or penetrations (chimneys, skylights, roof hatch, parapet walls, etc). This calculator is only as accurate as the numbers you plug into it. If your measurements are off, so will be the estimated roof size and price. It is important that you accurately measure your roof. Include any overhangs, bump-outs, and parapet walls. Include all parts of the roof into the calculator. Things like curb flashings (HVAC units, Chimneys, Skylights, Roof Hatches) or drains may seem of little importance to you, but they take considerable amount of time to flash properly and slow down the process. Don't forget tear-off. Most states require that your roof may not have more than TWO layers of materials (without special approval by building engineer or architect and permission from your City/Town building department). It is also recommended to remove all existing materials down to the roof deck, before installing a new roof. This allows you to remove all wet insulation and repair a rotted / rusted roof decking. Calculator limitations: It is important to understand that these are only approximate figures. Your actual price will greatly depend on your geographic location, roof complexity, the contractor you choose, and ever fluctuating cost of materials. We provide this calculator for reference ONLY propose, and it is not a solicitation or offer to install any roofing products. 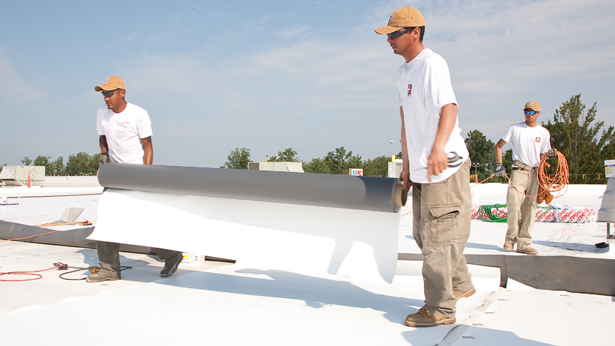 We recommend that you get at least 3 quotes from reputable, local contractors who specialize in Flat Roofing, and have extensive experience with Thermoplastic Single Ply systems, such as TPO and PVC heat-welded membranes. Always hire a contractor that has General Liability, Workers Comp and optionally Bond / Excess insurance. Also, ask for at least 3-5 references of jobs that are OVER 5 years old. Read more about TPO Roofing Installation. 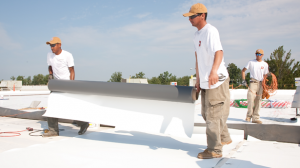 Related article: Which is better - TPO or EPDM Rubber roof? I had a TPO roof installed it is puddling water and is loose on edges. I’m not sure that this product is even appropriate for the area it was used in, it will have a lot of foot traffic and furniture on it. The TPO material appears that you can see fibers starting to show as well. Not sure if I should pay for this job or not. I am having to have it all removed and replaced. I already responded to you about deck furniture and foot traffic on TPO roof. However, if you had the job done, and it was done to specifications that you and your contractor agreed on, you should probably pay. I don’t see how it is roofer’s fault that TPO is not made for heavy foot traffic – you should have done the research ahead of time, and picked the right product. Most flat roof materials (PVC, TPO, EPDM Rubber) are explicitly NOT made for heavy foot traffic, and patio furniture. Puddling water is normal on flat roofs (as long as it’s not a huge “pond”), and does not disqualify roof as “improperly installed”. If you have puddles now, you probably had them before. To get rid of puddles, a Tapered Insulation system should have been installed, before TPO went down. But that is very expensive and most people chose to live with small puddles, instead of shelling out $3000-5000 extra for Tapered ISO. Now the “you can see fibers starting to show” is a bit weird. When did you have the roof installed? If you are still considering “not paying for the job” it means roof was just installed, so the only place you may see “fibers” is in seam edges, and that is normal. If you have fibers visible in field, that is a material defect. Please upload some pictures with fibers to Imgur and share a link here. I will take a look. Alse let me know who was the manufacturer of the TPO? Lastly, you can also upload pictures of puddles, and I will see if those are normal. PS – as I mentioned in my response to your question about furniture / foot traffic: you can still put floating deck on your TPO roof, or you can install some “walk threads” onto TPO, to make it walkable. I also believe you can put furniture onto walk threads. Roof is in emergency condition in Titusville. No insurance status so no delay for work to begin. Received a $14k quote for 1173 sf flat roof 1950s ranch. HELP! What the exact roof size? Did you get additional quotes? I recommend you know answers to the above questions, so you can compare quotes. Get additional quotes. Please elaborate on what kind of “HELP” you are looking for. I just had TPO installed on an addition and the contractor screwed the TPO into the guttering. They actually screwed through the guttering and the wood the guttering is screwed to. Is this the correct procedure? Seems crazy. Please advise! Well … this is not entirely correct, but also not completely wrong. Let me explain. You want the roof to overhang the gutter, so that water from the roof would not go behind gutters. Now what your contract did is wrong method. They should have used metal drip edge, that overhangs the gutter. Why they did not do it? Most likely because they were lazy, and it costs a pretty penny to have drip edge installed (vs aluminum termination bar) … We are talking about $4.5 per foot extra cost to the contractor. However, when you have 30-50 feet of roof edge, that is merely $150-250, and contractor should have priced that into the job. Now I don’t know if you discussed roof edge, and it was your idea to have termination bar vs drip edge. If so, then I think contractor did the right thing. If they installed screws above gutter, water would be “leaking” from behind the gutter, and you’d not like that. I live in a mobile home. It started out as a single and one of the former owners had an addition put on. I have no idea what shape the roof is in. However, the leaks that we have appear to be coming from the area where the addition connects with the original home. It is also a very old home and we cannot afford to buy a new home. Thank you!! Is there a question? I will assume that you need a solution. Cheapest option is to have a 3-4 foot wide strip of TPO / PVC or Rubber roof installed between addition and original roof. Tuck the strip under original roof and overlap the addition roof. I assume original roof is ABOVE or higher than addition. If not, reverse the order. Otherwise, you may want to consider replacing the whole roof. This will be costly however. You should be able to instal solar with ballasted racking on TPO roof, without any problems. What I would recommend to prevent any possible leak issues, is to use some sore of separation mat… even a strip of TPO material, where racking is in contact with roof. And of course, take into account combined weight of ballasted solar + snow load, to make sure your roof does not collapse if too much snow falls on it. The separation mat acts as a sacrificial layer when the PV system moves around. The key to the sacrificial layer is to have it adhered to the TPO, not to the bottom of the PV racking system. If the separation sheet is attached to the bottom of the rack, it moves when the rack moves and causes damage to the TPO membrane. I did not think you need to glue the separation layer. Your calculator would be much more helpful if the calculation included a ZIPCODE FIELD to immediately reflect LOCAL labor cost estimates (without waiting for local roofers to calculate the cost themselves and email it to me), since this will vary a TON depending on what state/ where a roofer is working. For example, your estimator estimates straight labor cost of installation of new TPO on simple roof with no penetrations etc at $640 per square. I think that is a national estimate, since its around $300 per square a crew gets per square for TPO here in Tennessee. When materials cost $170-200+ per square (membrane, drip edge, insulation, screws + plates, glue, patches, etc) – a “normal” roofing company CANNOT install it $300 and not lose money on the job. Also consider that most existing roofs should be stripped off, and old roofing must be disposed of. So you $300 figure is completely unrealistic. We did not put Zip Code field, because it is a usability issue – that’s why we have Region option – to account for different local markets. Yes it does – full installed cost. But obviously this is only an estimate, and actual prices will depend on the roof and location, and contractor, and materials used in the job, and many other factors. Still, these are pretty close estimates! I need to ‘sell’ this product to a property owner, but this site tells me nothing about the product. Brian, not to be rude or anything, but if you don’t know anything about TPO, maybe you should not be selling it. It is a fairly complex system and small mistakes can cost big bucks. I recommend you start by reading about particular products on manufacturers websites. Best of luck selling it, and don’t take personal offense please. As a means to give the customer some familiarity with ranges, it seems like an effective tool. Granted, every project is different and needs to be examined on a case by case basis, but I think this will help clients get a very good idea of what they need to be thinking in terms of. Thanks for the TPO roofing calculator. Very helpful tool. Been looking for something like this for awhile! I don’t think you will get a 30 year warranty anywhere. The max in commercial roofing is 25 years, and only on thickest membrane (typically 80+ mil), which is the most expensive option. Actually there are several manufacturers that will offer a 30 year NDL. You can get a 30 year warranty as long as certain conditions are met, such as installation needs to be done by a certified roofing contractor, also for a 30 year NDL warranty (No Dollar limit) it must be a commercial building. You will also be required to use 80 mil TPO, along with other detail requirements.